A product line of Discount Licensed Disney Plush Toys is now available through Highway Entertainment. 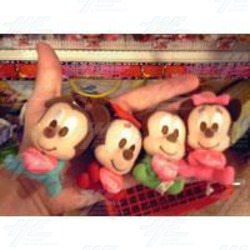 Characters include Mickey Mouse, Minnie Mouse, Winnie the Pooh & more. Each of the toys feature a character hugging a love heart with a date of the year printed on the heart. Each date features one of the cute characters in a different colour or facial expression. All loveable characters also double as a colourful key chain. Every box ordered contains 365 toys, one for each day of the year. Perfect for birthdays or remembering special occasions. This offer is only available to bulk order customers. For more information and pricing e-mail "> .